iPhone 3G users stuck in an AT&T dead zone at home or at work will soon be able to plug in a device that provides a strong local signal for up to 10 phones and four simultaneous voice or data connections via a connection to broadband Internet. 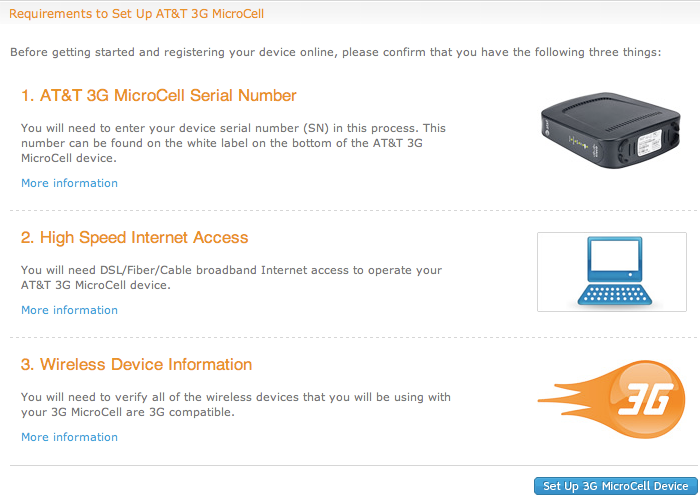 Price and availability haven't yet been set for the appliance, which AT&T calls the 3G MicroCell. The CDMA industry usually refers to local area, consumer cellular base stations as a "femtocell," suggesting a smaller version of the "picocell," an industry term for a cellular base station installed to extend the signal of standard "Node B" antennas of cellular networks. Apple has installed commercial GSM picocells with 3G base stations within its retail stores that work in parallel with WiFi base stations to give the locations both WiFi and 3G cellular signals. Just as with picocells and full scale cellular antennas, a femtocell automatically passes a mobile user's phone connection to the next nearest existing cellular towers as they leave the local signal area provided by the base station. AT&T's "MicroCell" branding suggests a device a thousand times more significant than a femtocell, but it's really the same thing. 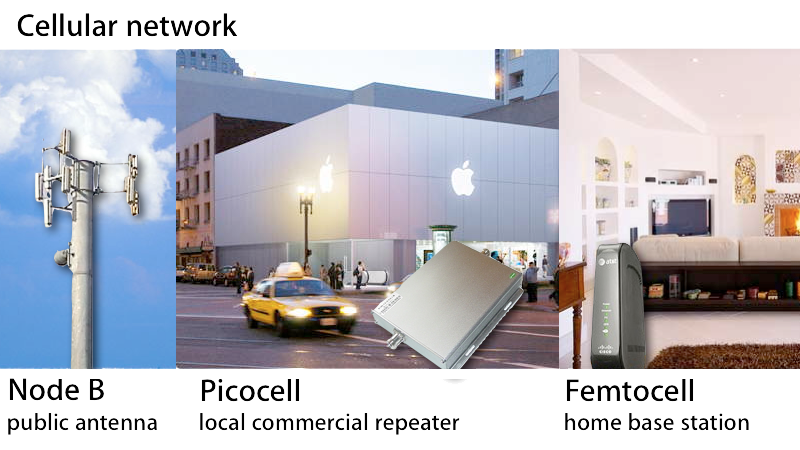 In the world of UMTS, a femtocell is usually called a Home Node B. In the US, both Sprint and Verizon Wireless have already begun selling femtocells that provide a local extension voice and data service, with Sprint charging $99 for its Samsung-built Airave box (first introduced in limited testing in the third quarter of 2007, and nationwide last October) and then charging a $4.99 monthly fee. Verizon charges $249 for its box, but does not charge any additional monthly fees. Both Sprint and Verizon are CDMA carriers. Sprint's femtocell is limited to extending relatively slow 2G CDMA2000 data service but not 3G EDVO; AT&T's box will provide full 3G UMTS voice and data service. The company has not yet stated if it will charge a one time fee for the appliance like Verizon, or whether it will bill a monthly fee as Sprint does. Installing the new 3G MicroCell box will require both an uplink to the Internet (by plugging into an Internet router via Ethernet) as well as GPS reception. AT&T's website notes that "a GPS link is needed to verify the device location during the initial startup." That would typically require installation near a window, as GPS signals are not usually strong enough to penetrate indoors. The device's location must be registered with AT&T to verify that it lies within the company's authorized service area, so it won't work overseas or in states where AT&T isn't licensed to supply mobile phone service. Last week, the Boy Genius Report published screen shots of AT's 3G MicroCell being listed as an option on both the company's internal service center systems and on its retail point of sale screens. Since then, AT&T itself has published information on setting up the device on its public website (below), but has subsequently removed some of the details on the page under the banner "maintenance in progress." That brings to mind the on-again, off-again clown antics the company pulled when advertising, then removing, the details of a program to provide iPhone users with free WiFi access at AT&T's hot spot locations at Starbucks, bookstores, and certain airports. It took awhile for that plan to finally become available, and AT&T is similarly not providing any answers as to when users can expect to be able to patch up the company's dead zone holes with the new femtocell appliance, nor how much extra it will cost them. Last spring, a report by ThinkPanmure stated that AT&T had inked a deal with small UK UMTS femtocell leader ip.access worth $500 million, giving AT&T 7 million femocell devices that it planed to sell to consumers for about $100. AT&T's 3G MicroCell product is built by Cisco however. T-Mobile, the other significant GSM/UMTS service provider in the US, has pursued a different strategy in extending its own UMTS network, which is considerably smaller and more limited than AT&T's. T-Mobile relies upon UMA (Unlicensed Mobile Access), a technology which bridges mobile calls over WiFi. Called "Unlimited HotSpot Calling," the program enables mobile phones to place calls anywhere on T-Mobile's WiFi hotspot network or from home WiFi base stations T-Mobile provides its customers, but also requires UMA support on the phone itself. It also carries an extra $10 monthly fee, and the process of monitoring both WiFi and GSM/UMTS signals for proper handoff strips significant battery life from the phone. Certain newer BlackBerry and Nokia models support UMA, but T-Mobile's high profile Android G1 currently does not. Supporting UMA "only" requires software on the phone set that knows how to place calls over WiFi. Delivering flawless support for UMA is tricky however, and users frequently complain of dropped calls and compatibility problems between UMA devices and specific models of WiFi routers. Current models of the iPhone should be capable of supporting UMA, if only AT&T were to allow it. The deal breaker for AT&T is that if it were to allow UMA service over WiFi, it wouldn't be able to bill users per minute or for long distance, as AT&T wouldn't even be carrying the call or aware it was being made. T-Mobile's considerably more limited US cellular network (and its finite options to potentially improve it outside of leveraging its WiFi hot spot network) give that company a stronger impetus to offer UMA. Apple committed to supporting third party iPhone apps providing VoIP using WiFi, but those apps (which already exist) can't place or receive calls to the users' regular phone number or pass calls to 3G or GSM when it becomes available. They require a separate account with another VoIP service provider. UMA promises to handle both problems. Apple would have to provide its own native UMA support in the iPhone's firmware in order for it to seamlessly place and receive calls over WiFi. With AT&T's 3G MicroCell on the horizon, the likelihood of that happening anytime soon is very small. The upside is that the new femtocell box from AT&T should provide users with fewer problems due to the technology being more mature and straightforward than the still experimental UMA. It also requires no updates to work with the iPhone 3G or any other 3G AT&T phone, and won't demand more from the phone's battery than 3G already does.